I guess I made it pretty clear that we’re never going to break Undine Library rules, didn’t I? 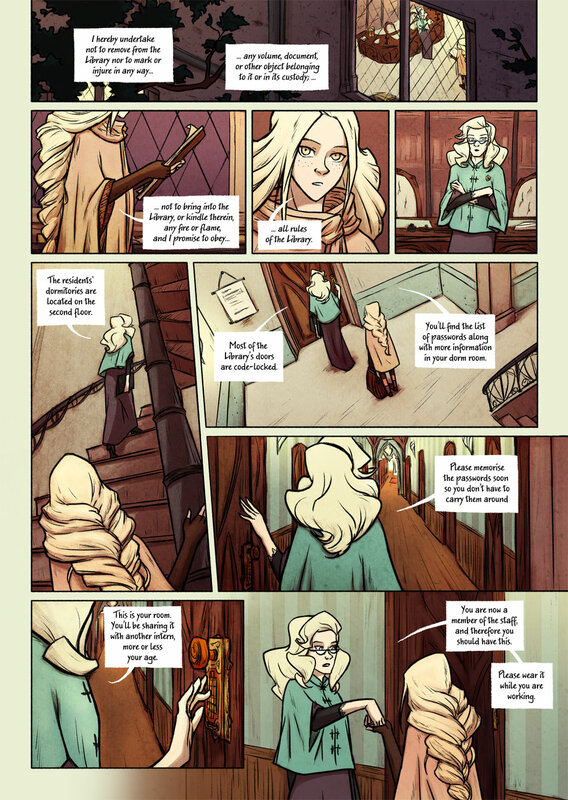 I enjoyed doing this page so much –in spite of the spiral staircase, what a headache! So I put my money on the library burning down before the years out, any takers? This is amazing and I seriosul really look forward to more. Thanks a lot! Glad you like Bookwyrms 😀 I don’t blame you for thinking the library could have such a future, haha. Yay I caught up again! Haha, no those rules will probably be followed to the letter! The drawing of the staircase paid off pretty well! I like it! Haha, thank you! Glad you think that about the staircase! Now I remember the first scene with the fire! chan chan chan!! The Bodleian oath! A wonderful touch. Lorena, I hope you don’t mind me pointing out… but in the second speech bubble of the first panel, it should be “its custody“, not it‘s. “It’s” always is the same as “it s”. “Its” is used to show possession. The easiest way to know which to use is to try substituting “it is” in its place. If it doesn’t fit, then it’s “its”. That is a long LONG hallway!